Liverpool have infuriated the rest of the Premier League, it has been claimed by the Daily Mirror, with league regulations potentially being changed ahead of next season as a result. 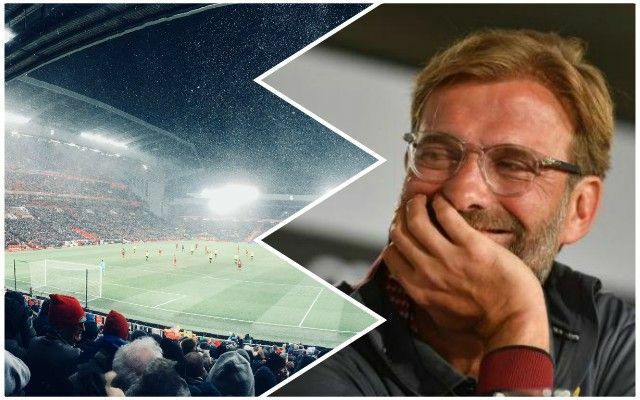 At half-time against Leicester City midweek, only half the pitch was cleared of snow – the half in which the Reds would attack in the second period – with groundstaff working to give Mo Salah, Roberto Firmino and Sadio Mane a marginal gain. Jurgen Klopp claimed the seven workers who entered the pitch simply could not cover the entirety of the playing surface, but the Reds have apparently come under pressure from several other Premier League clubs not to do it again. Many are reported to have been angered by the move, although it is unclear exactly how many have complained to the Premier League. Despite this being a simple example of home advantage, as every club playing on their home turf does every week in some form, be it not watering the grass or turning the heating up in the away dressing room, Premier League rules could be changed for next season as a result. The Reds have broken no rules and therefore cannot be punished, but if a rule change did come in because of this, it would be ridiculous. It’s called home advantage!